GUESS WHAT?!! It’s that time again! 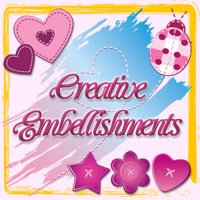 Creative Embellishments is having a dt call for their May – August term!!! I can honestly say CE is the most awesome company to design for! It’s family owned and operated and they are beyond generous with their designers. I LOVE working with their fabulous products and I love the drama free, friendly team atmosphere! If YOU want to be part of something amazing, love paper crafting and working with gorgeous laser cut chipboard, wood veneer and flair, get your application in! 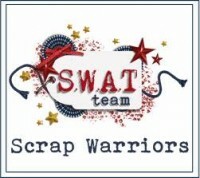 WE are looking for 8 fun crafty folks for our team. This term is a 4 month term. My goal is to have 3 DT calls a year. I want to keep things fresh and get our products into as many hands as possible. Must be good with deadlines. Write a blog post providing a brief description of what you did to alter the chipboard (or other products) along with a list of the products used linked to our store on our CE blog. Please share as well on your personal blog/facebook and any other social media site you are active on. Comment on participant’s entries to our monthly challenges. Good photography skills of projects required. Occasionally you will be asked to create 1 to 2 additional projects as guest spots at the sites we sponsor. This may not happen at all during this term but want to be prepared in case it does. So please keep this in mind. Please become a fan/follower of our blog, facebook, page, pinterest, google+, youtube, flikr and twitter. I realize not everyone are active on all these accounts but follow us where you can. $45.00 a month in Creative Embellishments product of your choice. 30% off any additional products. Creative Embellishments will promote your work on our blog, facebook page, pinterest, flikr and instagram. 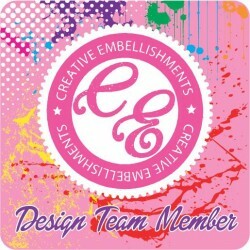 Email 3 photos of layouts, cards, tags, canvases and mixed media projects of your choice. ( PLEASE RESIZE THE PHOTOS YOU SEND TO 300K) They DO NOT have to be new but what you think represents your style best. The deadline for this call is March 28th. The designers will be contacted on or around April 1st . The term will run from May 1st 2015 through August 31st 2015. Thanks to all who apply in advance. I am sure it will not be an easy task to narrow it down to 8 people. There are so many talented folks out there. I am however looking for a well rounded team of all styles showcasing our products. This DT CALL is open to everyone.